High Quality, handmade hemp paper manufactured using a 2000 years old paper making technique. Base materials are 50% hemp with the remainder linen and cotton. Paper is acid free and meets archival standards. These sheets have a natural, soft deckle and they are 125gsm. Sheets are hand made so please allow for slight color deviations. Usable for Handwriting, Calligraphy, Inkjet Printing, Water Color, Pastel and Charcoal. This set contains 5 cards that measure 5.83x8.27 inches, plus 5 matching envelopes. 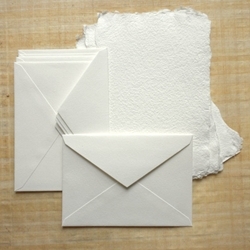 The paper cards have a feather deckle and the weight is 250gsm.